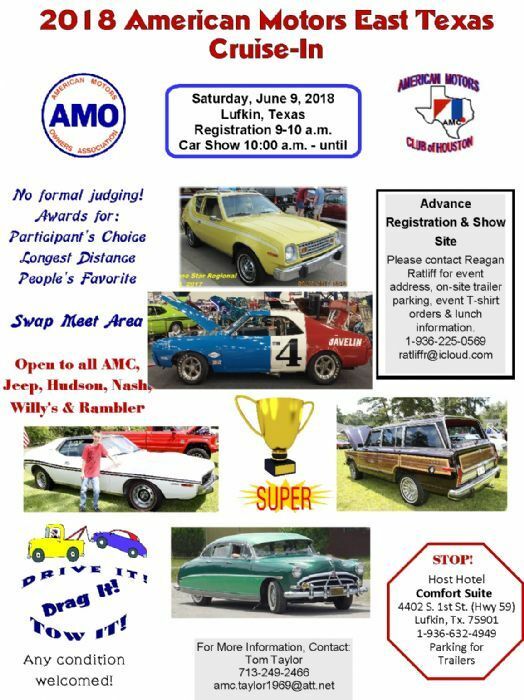 Quote Reply Calendar Event: EAST TX AMC CRUISE-IN, JUNE 9, 2018, 7TH ANNUAL! Be sure to scroll through all the above links to check out the different picture albums and video links and postings. Me, Teresa and The Rambler will be there !!!! I would like to go....how do I post a picture of my amc ? I believe you must have 30 points to post a picture. It won't take long. Where you located? Good to have you on the Forum and we'd certainly love to have you attend in June. Don't know how the picture posting qualifications work, but you can private message (PM) me your pics or email to ratliffr@icloud.com and I'll get one up on the event posting for you. What AMC will you be bringing and where are you located? Interest is ramping up. We've got our Mississippi friends coming, we've got a caravan of folks from Ft. Worth and Dallas coming, we've got Houston folks coming, don't be left out. Here is the flyer for this years' event. Thanks to Tom and Janice Taylor for putting it together. I am posting the event registration form below. We need to get a head count on attendance as soon as possible so we can plan for and determine things like how much lunch my dear wife Misty will be preparing (those that have attended know to come hungry and you will be fed well ). Please, print out, complete, scan and e-mail the form to me at ratliffr@icloud.com If you are unable to do that please print it out and complete it and take a picture and text me the completed form to 936-225-0569. If you are unable to do that contact me to let me know how many will be attending and bring your completed form on June 9th. I will be putting out some event t-shirt info soon as well. Remember, we have an area for parts sale and swap, so even if you can't bring your vehicle you could still help someone else out with that much needed part. We look forward to seeing everyone again this year and to seeing some new faces too. Count me and Teresa in the crowd. Got our hotel reservations. Plan 3 meals for us, I will eat The Rambler's share !! !